In fact, Free Street, where Gamboa is a Resident Artist, always pays their artists a living wage. I participated in auditions for one of their productions, where instead of monologues Artistic Director Coya Paz takes performers through a series of collaborative storytelling exercises. At the end of the session, anyone who wants to create and be in the production with them is welcome to participate and paid for their time. Meet Juan(ito) Doe takes place in a Back of the Yards Storefront. Local artist Alonzo Torres-Tapia remodeled the entire space, including making the accessible, painting the walls, and much more. Andres Lemus-Spont put the final touches on designing this “StoryFront,” shopping carts and bicycles appear to be stuck halfway in the walls, and there are couches and chairs for about thirty audience members in the alley-configured space. When the actors enter from the street, they bring in cases that contain the rest of the world of the play. Clotheslines with various costume pieces are hung in the corners by each of the storytellers at the opening of the play. Most of these movement sequences that guide the world building of the play are accompanied by musical selections curated by Jacquelyn Carmen Guerrero. 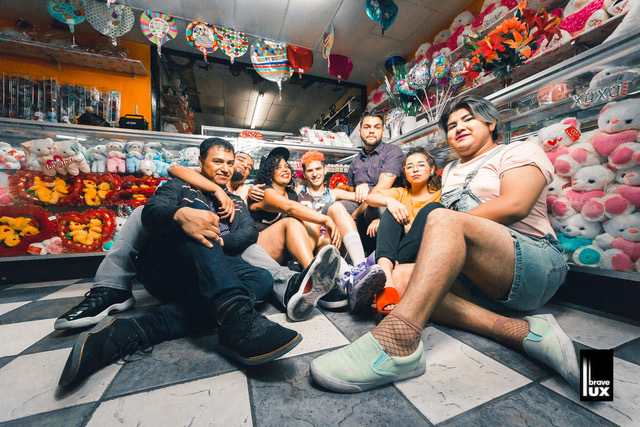 These songs range from ballads by Mexican crooners, to the Delfonics, to pulsing beats that invoke the atmosphere of queer clubs we know and love. There is not a single aspect of that space that goes underutilized when it comes to design. The lighting design, a co-collaboration between Ricardo Gamboa and Jacob Snodgrass, ranges from a strobe light in the bathroom to light up water containers used elegantly in a movement sequence that quickly turns into a raucous party. The sound is played off of a lone speaker, which is perfect for the intimate space. Meet Juan(ito) Doe is an ethnographic project in nature, but deviates from the typical interview style of documentary theatre. The way that the team collected the stories is as innovative as the piece, instead of straightforward interviews they would host events such as karaoke nights where people could request songs that reminded them of their uncle, or their grandmother. In the end, these aren’t direct transcripts, but rather composites of many experiences taking the form of original writing called totems informed by the stories. The performers themselves (Lily Be, Nicolas Del Valle Jr., Keren Diaz de Leon, Sebastian Olayo, Alejandro Reyes, Anthony Soto) come from various disciplines but are not trained actors. For example, Lily Be is an award-winning storyteller. The ensemble was trained by skilled actor and monologue coach Sean James Williams Parris for this performance. Among the monologues is an anti-establishment graffiti artist (Nicolas Del Valle Jr) who just wants to leave his mark on Chicago. He makes an excellent point about corporations having the ability to slap their name on everything, and therefore believes individuals should have that power. An endearing stoner (Keren Diaz Lion) who wants to connect with her family, and a young queer person (Sebastian Olayo) who asserts being queer is like being God, “you give birth every time you walk out the door”. The entire experience feels like being welcomed into a friends’ family party, you understand some of the customs, and some are unfamiliar. Some dialogue is in Spanish, but you never miss the plot. Oftentimes when I see work about a culture, I think it makes the audience dangerously comfortable asserting themselves as a piece of that culture – because they were a part of the show they “get it” now. Meet Juan(ito) Doe’s ensemble does a wonderful job inviting us into their experiences and making them relatable without allowing us to appropriate them. These stories are shared with so much love that you feel lucky to witness the event with these few other strangers on a dark and chilly night. Ricardo announced at the end of the play that the space would continue to stay open as a StoryFront and workshop space that will be used for whatever creative or organizing needs the community may have. Examples included a queer collective, Know Your Rights Workshops, and much more, Gamboa is encouraging residents of the community to bring their ideas forward so the space is truly theirs. This is what happens when theatre is approached from a co-creating mindset, rather than theatre makers creating something for the audience to consume. This is how the art we make can have lasting impact and benefit a community. Gamboa is part of the Playwrights Unit at the Goodman Theatre this year. Meet Juan(ito) Doe runs Mondays and Fridays at 7:30pm, and has just extended to November 17th! Pay-What-You-Can and Free Entry. Additional performances as part of the Chicago International Latino Theater Festival October 26-28th. Certain performances will have childcare, and ASL interpreters, see http://freestreet.org/events for more information. BIAS ALERT: I have worked on one of Ricardo Gamboa’s projects, a web series called Brujos. The extent of my professional relationship with Free Street is attending that one audition session.